Further topics on the subject of analog electronics are available with 4 sequential sets of plug-in equipment. In this way, a complete basic knowledge can be built up using interesting exercises. 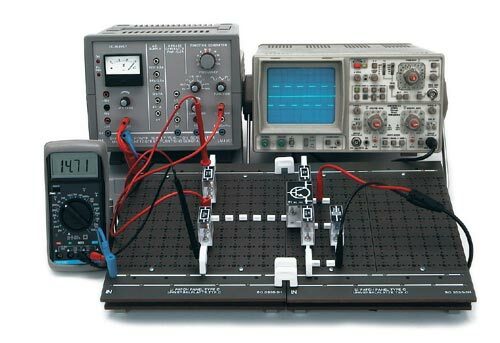 Passive components and various semiconductors are examined in exercises, characteristics recorded and the knowledge gained is then applied to typical, practical application circuits. In particular, emphasis is placed on the use of multimeters and an oscilloscope in the techniques of measurement. The plug-in system as a traditional modular building-block system carries considerable advantages for a sound, practice-oriented training in the field of electronics. The plug-in components are inserted in the universal patch-panel as in a circuit diagram to produce the finished circuit and result in a clear, easily understood arrangement. with widths of 228 or 456 mm. All versions can be used in an H-profile exercise frame or as a desk-type table-top workplace. Site generate in 0.094 seconds.